When Jude received ashes last week, the extraordinary minister didn't repeat the usual admonishments. She did not remind him that he was from and would return to dust, nor was he told to turn from sin. At the age of five, he is sinless -- he is too young to be considered a sinner. But what struck me was what she DID say...simply "Follow Jesus." I had been mulling what I wanted to do with him as our Lenten project. Last year, we constructed a craft foam cross. 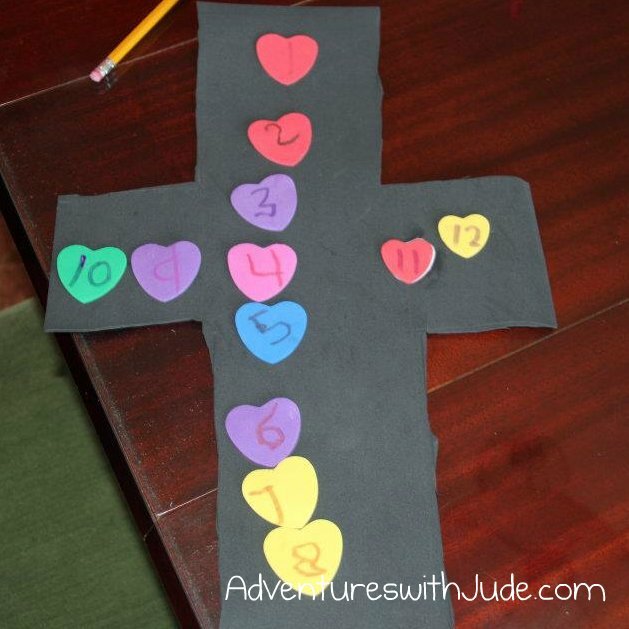 From an education standpoint, we wrote the number of the day of Lent (counting, writing) on colorful hearts (learning shapes), and glued it to the black cross. What started as a bare, black figure on Ash Wednesday was eventually a symbol of the true Cross -- darkness conquered by and covered in love. For this year, I wanted to do something different. 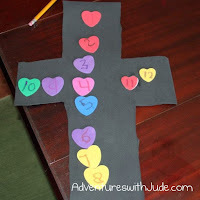 For a "schoolwork learning" project, we are doing a Bible verse daily. The verses come from the Daily Mass, and are chosen from either the reading, psalm, or gospel. Bible verses are good for copy work, letter recognition, and Bible learning. It's also a good daily project. But it still wasn't quite what I wanted - they are not "special" for Lent because we have been doing them for several months. I finally found an idea over at Catholic Icing. It was a drawn path, laid out with a "cobblestone" for each day of Lent. I knew immediately it was what we were going to do. Each day, we are coloring a stone on our path - in essence, following Jesus as He walked to Calvary.